As Martha McSally’s anti-climactic unveiling of her run for Jeff Flake’s Senate seat looms, it is important to listen to the rhetoric change in her carefully crafted persona. For years, her constituents have tried to nail her down on issues important to them. She carefully controls her message resulting in voters not really knowing where she stands on most issues, particularly when her rhetoric doesn’t match her votes. But a particularly disturbing trend began when she decided to run for Senate and “leaked” it to her colleagues over 2 months ago. Trump, whom she had gone to great lengths to distance herself from, was now her new BFF. Laurie Roberts of the Arizona Republic wrote about it best, quoting Arizona Daily Star’s Tim Steller who predicted the Senate run based on the number of Tweets mentioning Trump that the suddenly gushing McSally had published. This statement shows how out of touch our Congress is. In many polls (see citation one, two, three) after Trump declared an end to DACA protections to 800,000 people, even Republicans overwhelmingly favored continuing their protections. 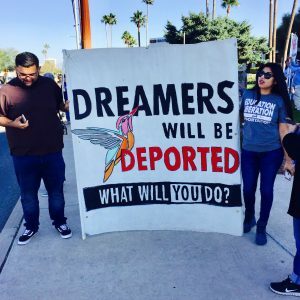 If Republican members of Congress want to truly represent their constituents, they need to be more than “willing to have a conversation” about an alternative to deporting 800,000 young people who McSally herself said followed all the rules and only know the US as their home. This policy issue presents Martha with an irresistible opportunity. She gets to appear as a hawk on immigration and secures a place on the Senate Committee on Homeland Security once elected. Peddle the fear, offer the solution. Her ambition has been clear to us since Trump took office, as she comments about terrorists only if they are non-citizens and has consistently run on issues of shoring up the border even though her messages have been mixed at best and misleading at worst. But this sudden change in tone is new. 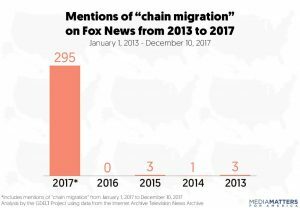 Take a look at the term “chain migration.” This term had its early start in White Nationalist circles, but it was Fox “News” and Breitbart that started pushing the term to peddle their anti-immigration narrative as pointed out on Media Matters here. So while the trend is disturbing and at times a 180 from prior statements about immigration and DACA, one thing remains clear; we still don’t know where Martha McSally really stands on issues. Her principles seem to change when the political winds shift. Arizonans deserve a better, clearer idea of who their representative will be when they head to the polls.